Up around 8am today, breakfast, and then off for the first walk of the day, up Bellever Tor which is just outside the hostel. I decided to take the longer route through Bellever Forest, a pine plantation that runs up the hill. 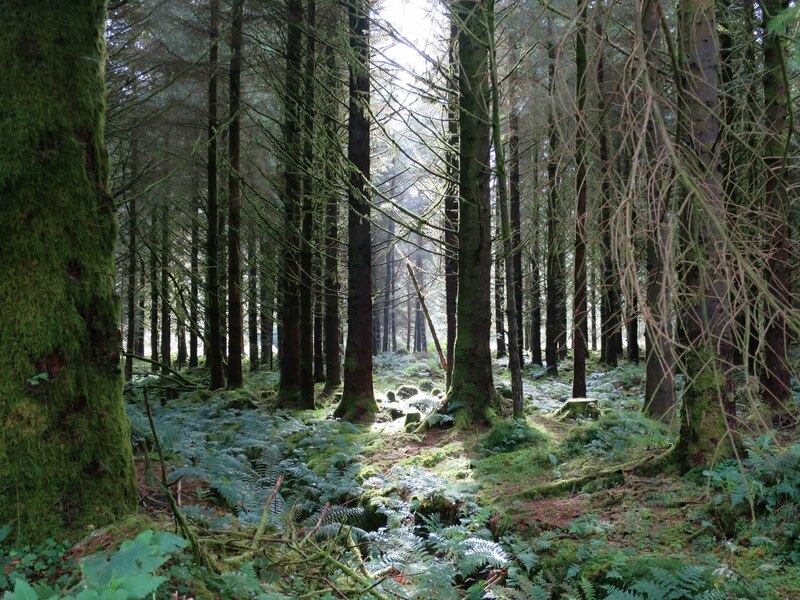 As you walk through the rows of tall conifers, you can look up the hill and see the moss, all growing on the same side of the trees, or down and see their bare backs. It was a quiet walk but I met a couple of people wandering through: a few fellow hikers and a forest ranger. I went up to the top of the Top for a climb and a play about. It was very windy, with a little drizzle blowing in, but that seemed about right and didn't spoil the view at all. My first long view of the expanses of Dartmoor. I'm from Norfolk, which has a very different style of long view, but to have so much sky all to myself felt right. Meanderedering around I spent some time watching ponies, and then came down the other side towards Postbridge to look for the stone rows, cists (burial stones) and hut circles that were in the area. Found a few too! Some are authentic, while others have been over-enthusiastically reconstructed by those pesky Victorians. When I finally came back down from the Tor (the short route!) it was 11.30 and I could drive down to Postbridge to go to the Visitors Centre and pick up a proper OS map. From there I went to Two Bridges, with the intention of taking the short and well-trodden path to Wistman's Wood. I've wanted to go here for a long time, but as usual the path less taken proved distracting. 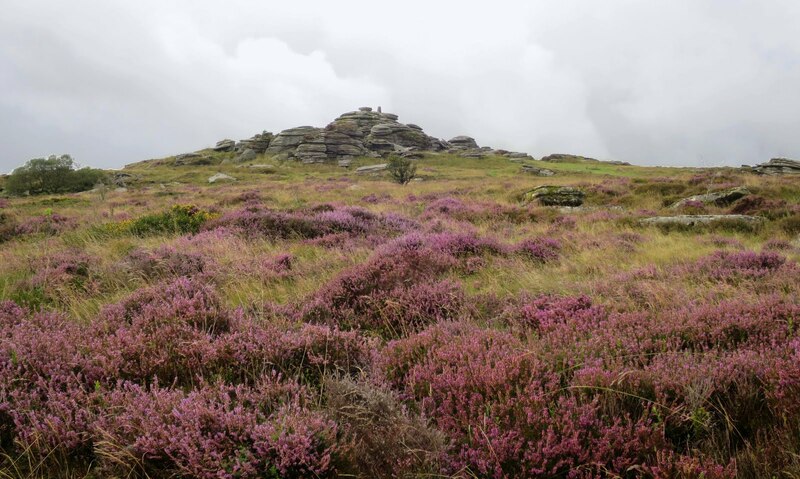 What I ended up doing first was going up onto the moor and walking from tor to tor, all the way to Upper White Tor. The route back. Just follow the tors into the distance. Each time I reached one tor, I'd spot another, and couldn't resist going just a little bit further. The weather, though very windy so high up, was gorgeous - just a little sunny and nice and clear with no risk of low cloud. I suddenly realise that I felt so happy. Happy being up there and being able to see so far, and enjoying myself so much walking through the world. Even here, the little yellow Tormentil flowers were easy to spot. I sat in the lee of a tor to eat my packed lunch, then kept going. Eventually I did turn round and came back down to Wistman's Wood, which was like walking into the Old Forest from The Lord of the Rings. It's one of the three ancient woodlands that used to cover what is now moorland, and is thick with green. You're clambering over rocks inches deep in moss (carefully, trying not to disturb it), surrounded by gnarly, stunted oak trees, ferns growing out of their branches in miniature copies of the wood, green beards wafting like spiderwebs in the breeze. The canopy muffles the sound from outside, enclosing you in your own little world. It's a small wood, but it's own little dimension that makes imaging mythical creatures very easy. The photos really don't do it justice. Someone's said a prayer here. I left it alone. I love it here. I'm already thinking that three days will not be enough time to soak it all slowly in, and I've been lucky with the weather so far. I just love the quiet and the space and the openness of it. I'd forgotten how much I value these things, and it makes me think that I will enjoy having a house.